In this post, Epsita Halder, one of the researchers who received the Social Media Research grant for 2016, introduces her proposed work. For the past 20 years, globalization and new media have been influential in shaping the religious landscape of South Asia. 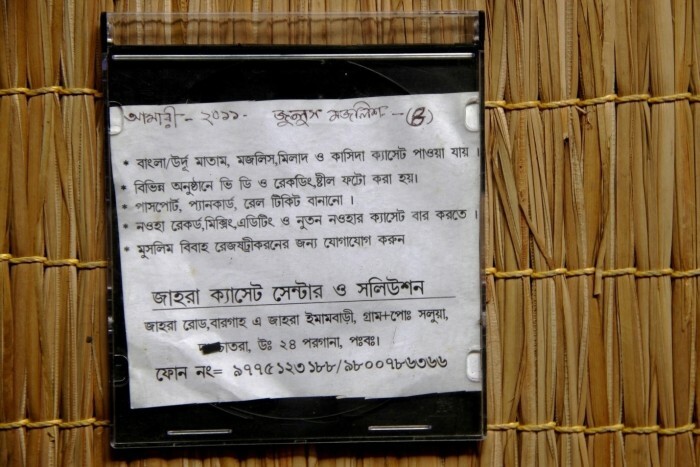 The Shia imagination, even in the remotest villages of Bengal, was first fired by the era of anolog technology via cassettes and then caught in the web of digital media. This is a phenomenon more apparent in the traditions of Muharram, as the Shia religious morality enacted through mourning over the martyrdom of Imam Husayn, the grandson of Prophet Muhammad, in the battle of Karbala in 680 AD re-creates the community’s historical-narrative basis. Within 200 years of the historical event, the story/history seeped into the domain of the community’s narrative imagination in the form of small lyrical exposition (nawha, marsiya) and long narratives (jungnama) circulated in the Islamicate world. As the gap between the majority Sunni and the minority Shia communities in South Asia yawned, Shia religiosity based on Husyan-centric piety took up several affective aural-visual-performative traditions for the consolidation of the community. Having a minority status and considered a false form of Islam, most of the times Shia piety takes the form of religious subculture, which uses elements from the changing modes of communication. Along with the changing notion of piety, changes came in the modes of communication, impacting the formation of the community and its identification vis-à-vis the local and pan-Islamic forces. Since the 1990s, lament in the form of elegies started to be produced/reproduced in digitized format, were circulated from Pakistan and crossed the borders of India and Bangladesh to enter local markets. 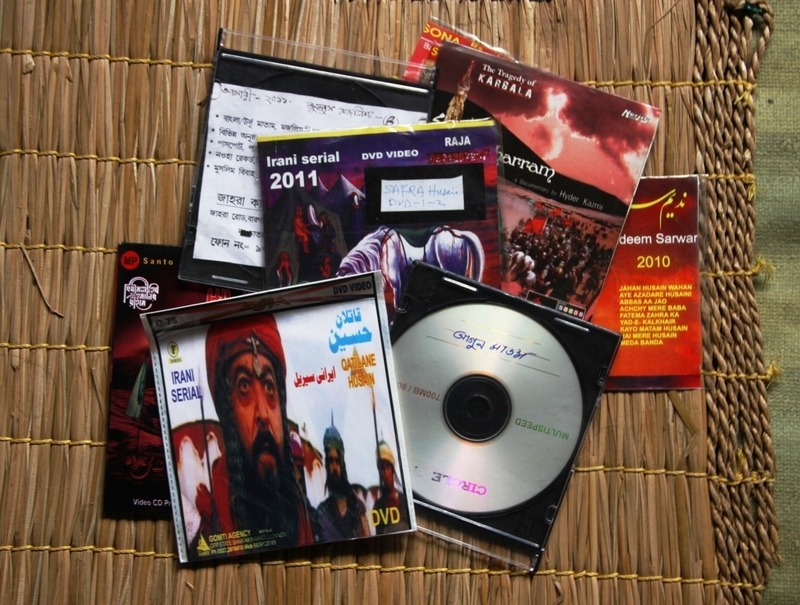 The ever-expanding network community of Shias on the web has now been produced through imported CDs/DVDs, circulated in different Shia hubs of Bengal through religious centres in Mumbai and Lucknow. In Bengal, Kolkata has become the central market for these imported sacred items. Rural Shia markets (in the districts of North 24 Parganas, Hooghly and Murshidabad) buy, save, copy using cheap and easily available technology or simply exchange via Bluetooth and save on hard drives. This digitized format has reconfigured the forms of imagining and performing the sacred. Now the sacred nawha – the sacred text read (performed) at a sacred time – can be played anytime on the cell or on a CD/DVD player, thus making possible a reconfiguration of individual agency within the structure of religion. The nawha thus have come out of the sacred space of performance to a new domain where the forces of new media, globalized market, popular piety and Shia identity are intertwined. In his study of the cassette-sermon culture, Charles Hirshkind shows how new channels of communication enabled the pious subject to listen from the heart. At the same time, technology and new media introduce a new sensorium that needs to be understood to map audio-visual configurations that reframe the experience of religion. My study will inquire how Shia groups (located at different socio-political contexts) perceive, consume and respond to different forms of media practice – the digital, the internet, the cellphone and others. Media practice, then, should be understood as a consumption-participation network, and the community a networked one performing online and offline rituals. It is to be noted how the community and the individual, with their distinct choices, use new media as a response to devotional landscape, community history and contemporary ways of life. From the desire and making of digitized nawha on CDs/DVDs, and media gallery and Bluetooth in cell phones, the processes of various forms of individuation may be deduced. My study will simultaneously initiate a critical survey of the presence of new media-enabled religion in the everyday life of Shia communities in West Bengal placed at various points on the hierarchies of literacy and economy. Another form of agency can be discerned when under the influence of digital piety coming from Pakistan local aspirants started to translate the nawha from Urdu into Bangla and make their own CDs/DVDs for the local market. Simultaneously, a whole new set of institutions cropped up to affirm this new sociability that includes new religious sub-institutions, grassroots efforts to spread Islamic knowledge to the masses living on the margins, organizations to mobilize the youth and a newer kind of authority over Shia religiosity. 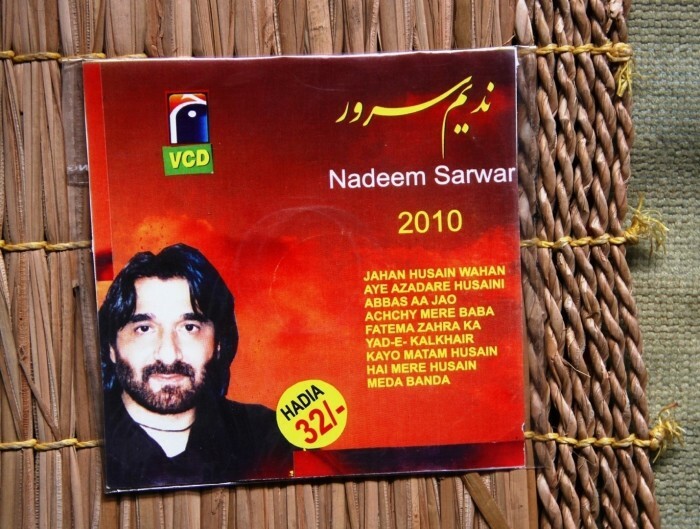 Through new dissemination patterns of nawhas — Bluetooth and easy and exponential proliferation of copied and burnt CDs/DVDs — new ways of listening and performing are visible, invoking a Shia public sphere which, in turn, influences and mobilizes other hitherto-unknown ways of transmission. In this dynamic market-based knowledge, the community is produced as the consumer of cheaply available religious texts which work on and re-enact knowledge to create a specific religious public sphere within the secular state. This consumer culture structures a new identification within the community, placing it within bigger global circuit of Shi’sm and positing a distinct brand of difference within India. I have been working on the Shia communities in West Bengal for the last five years. During my travels in the urban and rural quarters, especially the more structured and consolidated ones under the Art Research and Documentation Grant from India Foundation for the Arts (IFA), Bangalore, I have understood that digital culture, seeking to bind the spatially and socially multifarious Shia communities in a unitary notion of the community, ironically and unintentionally exposes much more. The reception and consumption-re-enactment of the digital culture, a reworking on/with it, actually fails to create a monolithic sense of the community, baring multiple identities and temporalities. The multifarious ways of consumption, reception and re-enactment of digitized texts open up possibilities to contextualize Shia communities with multiple intentions on how to become a community, shattering monolithic assumptions. These different configurations of the community’s intentions can also be studied through the lens of the community’s historical experience of migration and conversion. My project will try to locate digital culture in Shia districts of Bengal to understand identity formation of the community after the advent of new media. Engaging with this new visual-aural piety of these diverse modalities of transmission and reception, I will try to map and understand the new efforts to identify contemporary Shia communities. I will be working in neighbourhoods of Kolkata, Howrah, Hooghly and Murshidabad, which have different compositions of the Shia populace. Metiabruz, Rajabajar and Ripon Street in Kolkata have three kinds of socio-historical lineage, different stages of exposure to new media and different linguistic affiliations. I will also be working in two districts outside Kolkata -Hooghly and Murshidabad – one a major Shia centre for learning and the latter had Shi’ism as the state religion under the rule of the Nawabs. Based on my ethnographic findings, I will draw my inferences about the difference in consumption, reception and overall impact of new media in the urban, fringe and rural Shia localities, and how it affects scriptural and popular piety in the communities surveyed.